Who’s in your network and how DO you know they are there? 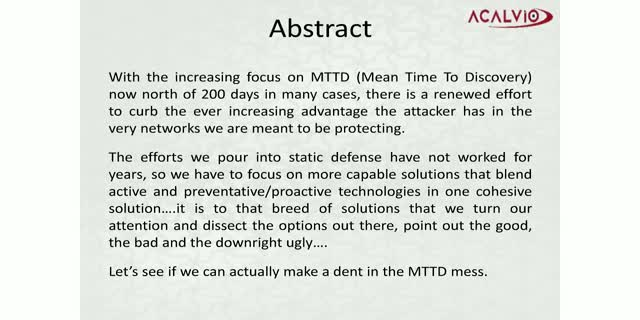 With the increasing focus on MTTD (Mean Time To Discovery) now north of 200 days in many cases, there is a renewed effort to curb the ever increasing advantage the attacker has in the very networks we are meant to be protecting. The efforts we pour into static defense have not worked for years, so we have to focus on more capable solutions that blend active and preventative/proactive technologies in one cohesive solution….it is to that breed of solutions that we turn our attention and dissect the options out there, point out the good, the bad and the downright ugly….Let’s see if we can actually make a dent in the 200 days. Deception-based solutions can provide a wealth of information about how adversaries behave as they attempt to complete their mission. Depending on the level of engagement organizations desire to setup in their deception solution, information gleaned can include basic network connection information or every keystroke, command and action taken when a system is accessed. Understanding where in the attack life-cycle your deception information is coming from is critical to knowing how to utilize that information to strengthen your SOC / IR Operational Workflows. This webinar will discuss the types of information that can be gathered by Deception Solutions based on different levels of engagement and how that information can be used in the most effective manner with your Threat Intelligence and Security Analytics platforms. John Bradshaw, Sr. Director, Solutions Engineering at Acalvio Technologies, has more than 25 years of experience in the Cyber Security industry focusing on advanced, targeted threats. He held senior leadership roles at Mandiant, ArcSight, Internet Security Systems, Lastline, and UUNET. TAG-Cyber's Ed Amoroso Interviews Acalvio's John Bradshaw about advanced threats, deception and more. Three minutes. In general, front-line security operations analysts have three minutes to evaluate an alert on their front pane of glass and determine if it warrants further investigation or can be dismissed as "not impactful to the organization". Your analysts must be right every single time in order to prevent a breach that could cost millions of dollars, the adversary - they only need to be right one time. - How SOC / IR teams can utilize high-fidelity alerts such as those generated by Deception-based solutions. - Power of correlation and data analytics to reduce the time it takes to answer basic triage questions on an alert. - How to develop actionable visualizations that improve the hunt for adversaries in your network. Recent cyber attacks and data breaches clearly show that traditional perimeter-based information security tools are ineffective against ransomware attacks, insider attacks, multi-stage attacks, and APTs. Cyber criminals have crafted tools and devised techniques that enable them to evade detection by traditional security tools. Also, even if real alerts are triggered, they can either get lost among a large number of false alerts or lost in a deluge of alerts, resulting in very low signal/noise ratio. Deception provides an alternative tool to traditional tools with nearly 0% false positive rate to detect, engage, trap and remediate inside-network attacks. Furthermore, by fusing deception with AI, one does not need to boil the ocean to detect anomalies in raw data. Instead anomalies are surfaced itself when an attacker bumps into the deceptions. Using AI, deception alerts are correlated with other data sources to provide actionable insights about the adversary profile, lateral movements and attack tactics. In this talk, we share our work on the fusion of deception and AI for active defense. This session will discuss the ongoing problem of identifying attackers who have successfully evaded prevention technologies such as firewalls, IPS and antivirus. It will focus on deception technology and its practical approaches to quickly detecting attackers already inside your network. Special attention will be given to working with SIEMs to validate alerts, as well as incident response and forensic procedures. As a society, we continue to focus on the capabilities that new technological products and services bring to bear, leaving the security - or rather, the safety - conversation for a later date and time… if at all. Why is this? Perhaps it’s because we don’t care. Or, perhaps it’s because we don’t understand how things work. Or, maybe it’s because we don’t know all the technical mumbo jumbo. Or, it could just be that we expect “someone else” to take care of it for us. For example, every car has a seat belt, right? We don’t have to ask for the car dealer to add seat belts for us and there really aren’t different types of seat belts available in the commercial car arena. Cars just come with seat belts - period. We expect them to be there - even if some people choose to not wear them. Regardless of the reason(s) behind the lack of conversation surrounding cybersecurity, we should all be able to agree on one simple fact: we use these new gadgets and services completely unfettered - with little to no regard to the risks we face for our privacy and even our safety. - Learning to ask is this thing secure? - Understanding how or why it is or isn’t safe to use. - Identifying your role in your own cyber safety and that of those around you. It’s time to open our eyes and become aware of our surroundings. Join us to become aware. This presentation will cover some Practical Applications of Deception and use cases with examples from professor Mohammed Almeshekah, PhD from Purdue and MSc from RHUL. He is currently an assistant professor at KSU and actively consulting. He has worked with Google's Chrome security team, Firefox, and published dozens of papers and chapters in security, as well as built a number of tools. Join this interactive Q&A session and learn the facts about the recent NotPetya attack on the Ukraine and the collateral damage it caused by crippling large businesses and organizations worldwide. - How is NotPetya different from Petya and Wannacry? - What's next? How can companies better protect their data against similar attacks in the future? Fintech may still be in its early stages, but it's seen tremendous growth and is expected to see global investments exceed $150 billion in 2017. With the proliferation of mobile apps, cybersecurity is extremely important. Trust is a key difference maker for customers, so fintech companies need to ensure that their sensitive client information stays secure. Why the same old things don’t work, and how to build in a strategic advantage that will provide early warning to security teams, while also deceiving and delaying attackers who have already penetrated existing defenses. Regarded as one of the world’s foremost experts on counter threat intelligence within the cyber security industry, Chris Roberts is the chief security architect for Acalvio Technologies, helping to drive technology innovation and product leadership. Roberts directs a portfolio of services within Acalvio designed to improve the physical and digital security posture of both enterprise, industrial and government clients. In addition, Roberts works to shape the next generation of deception platforms and helps companies with their maturity modeling and overall security solutions. BrightTALK caught up with Acalvio Technologies security expert Chris Roberts for an in-depth conversation on the current state of information security, today's threatscape and a discussion on the cyber industry. Throughout history, deception has been a standard part of warfare. The same is true in cyberwarfare. With the introduction of Deception 2.0, vast new capabilities of detection are available to organizations in an automated, scalable, authentic fashion. With 2016 behind us, is this the last Yahoo breach we’ll hear about? Join Chris Roberts, Chief Security Architect at Acalvio Technologies as he discusses the lessons to be learned from the recently disclosed Yahoo breaches, and the nagging questions infosecurity professionals will try to answer in 2017. Advanced attacks continue to be increasingly difficult to detect, with an average mean time to detection still hovering over 200 days. We will discuss modern techniques used by attackers to penetrate defenses and move laterally through your organization undetected. Honeypots have historically offered some detection benefits, yet have been challenging to effectively and efficiently scale within the enterprise. Find out how modern Deception 2.0 technology changes this. Acalvio provides Advanced Threat Defense (ATD) solutions to detect, engage and respond to malicious activity inside the perimeter. The solutions are anchored on patented innovations in Deception and Data Science. This enables a DevOps approach to ATD, enabling ease of deployment, monitoring and management. Acalvio enriches its threat intelligence by data obtained from internal and partner eco-systems, enabling customers to benefit from defense in depth, reduce false positives, and derive actionable intelligence for remediation. Acalvio provides Advanced Threat Defense (ATD) solutions to detect, engage and respond to malicious activity inside the perimeter. The solutions are anchored on patented innovations in Deception and Data Science. Title: Who’s in your network and how DO you know they are there?